You will receive an invoice by post or email (configurable upon registration). Payment terms: 30 days net, 10 days 2% discount, depending on credit history. 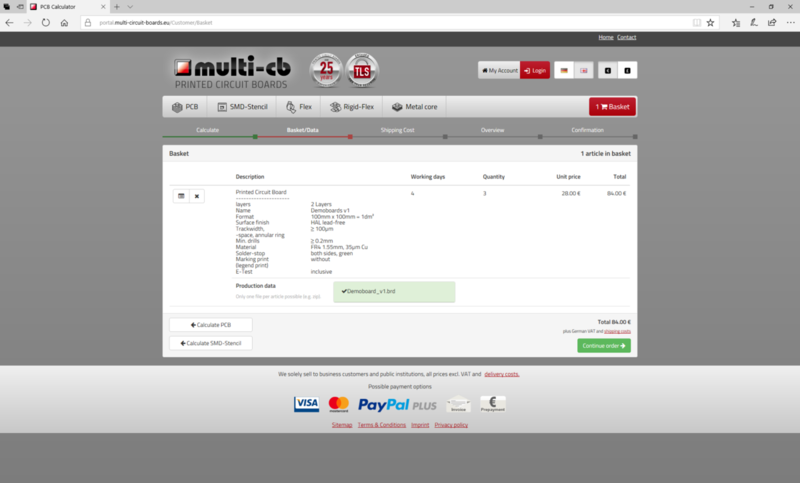 Production starts after receipt of payment or after receipt of a proof of payment (for example screenshot online banking, remittance advice). For your safety and convenience, credit card payments are processed by PayPal Plus. There is no PayPal account necessary. You can simply purchase with your credit card details. Your credit card details are not transmitted to Multi-CB but kept within the secure PayPal system. During purchasing, you are going to be redirected to PayPal. Please see following step-by-step guide for detailed information. You can enlarge the screenshots by clicking on them. Please upload necessary production data. 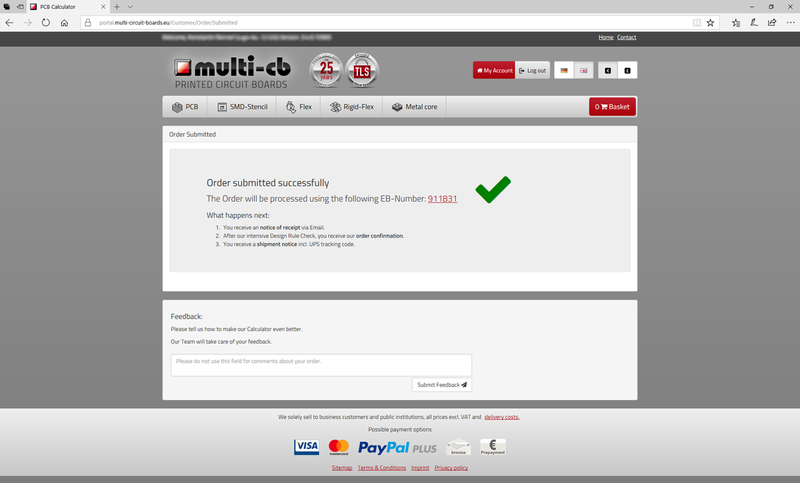 Then click on the green button "Continue order". In this step, you can define a shipping address and can select the shipping type. Please choose "PayPal / credit card (without PayPal!)" 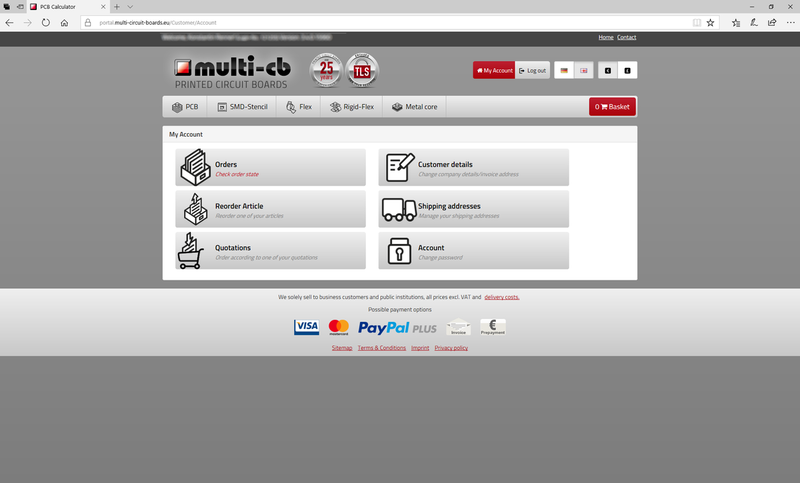 from the payment options and click on the green button "Continue order". In the overview, you can check the specifications and details. 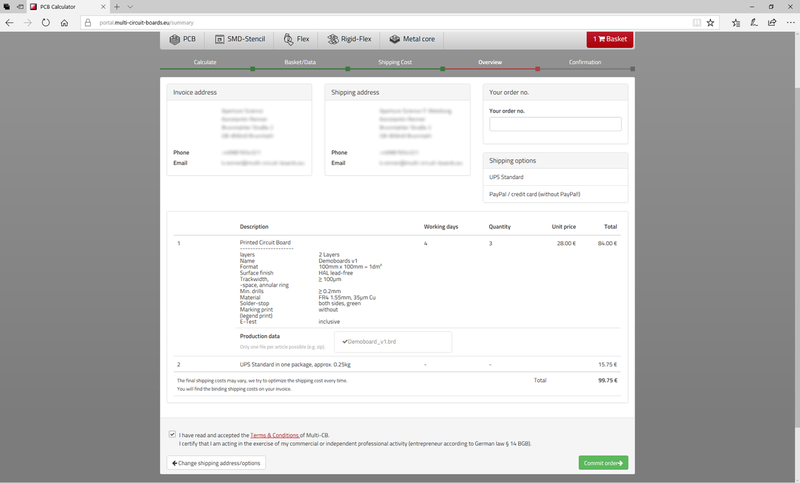 Among the shipping options, the chosen payment method is displayed. Please confirm the Terms & Conditions and click on "Commit order". From the list, please select "Credit Card", by either clicking on the text or on the credit card icons. 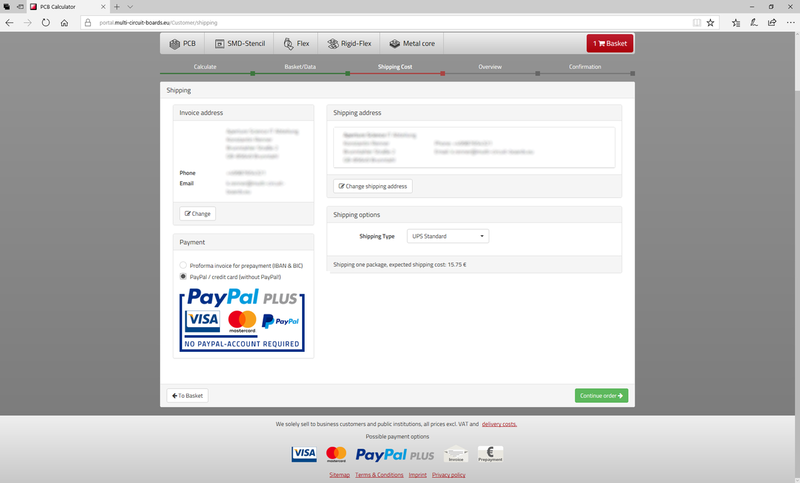 You might get displayed more payment options than in the screenshot on the right. After selecting Credit Card from the list, please click on the blue button "Continue". Please fill in your credit card details and billing address. 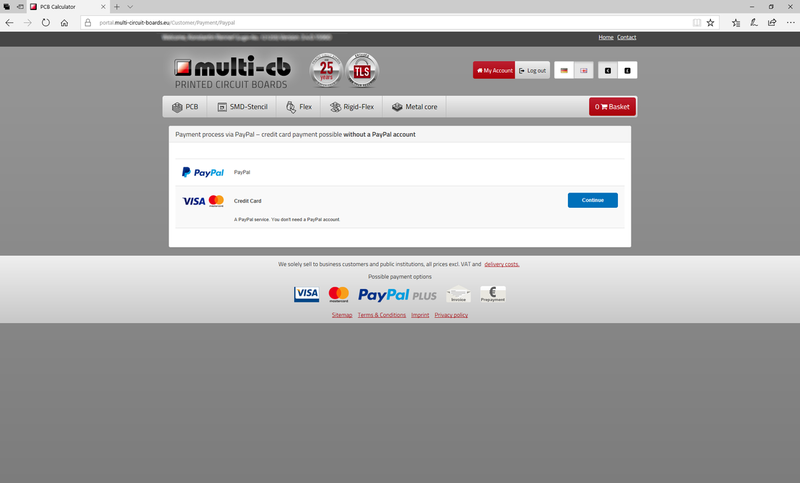 Multi-CB will not get your credit card details. The details are directly transmitted between you and PayPal. 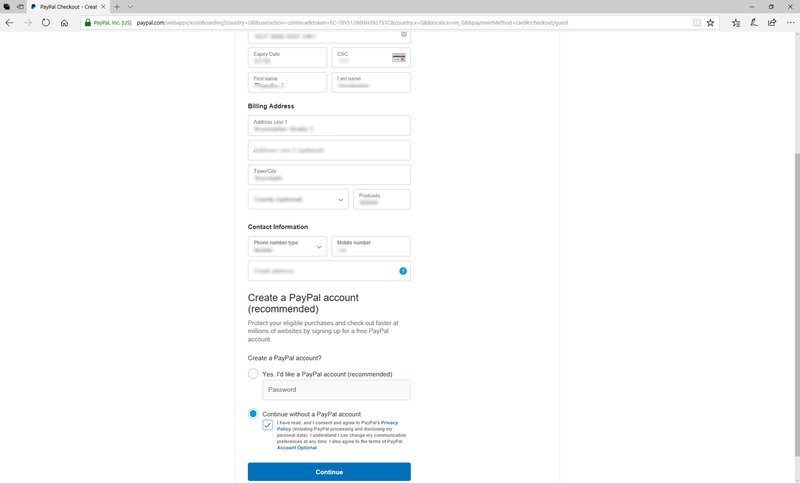 At the bottom, please select "Continue without a PayPal account." To proceed, please click on the blue button "Continue". 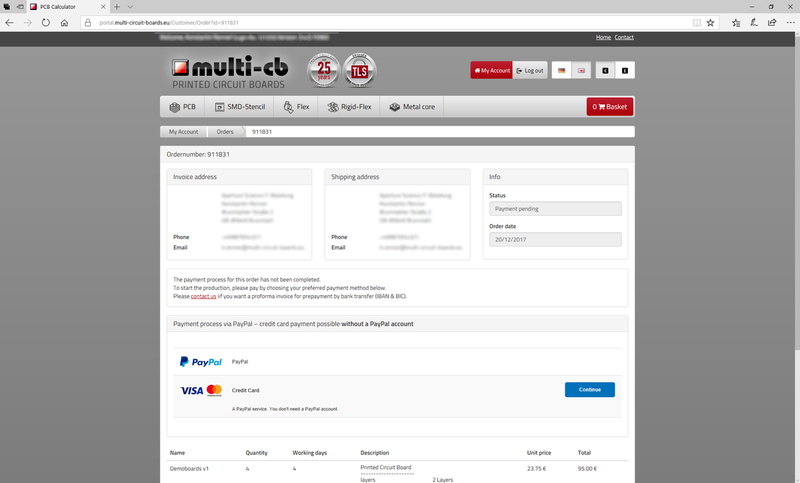 If the credit card payment has been successfull, you will be redirected to the Multi-CB Portal, displaying a confirmation that the order has been submitted. Our CAM station checks now your production data. In case you faced any problems, you can restart the payment process by clicking on "Orders" on the top left of the page "My Account". In case you face any difficulties, please do not hesitate to contact us. Please click on the "Info" icon of the order you want to pay. When status is "Payment pending", you can choose the preferred payment option from the list. For details, please refer to step 4 of this guide.